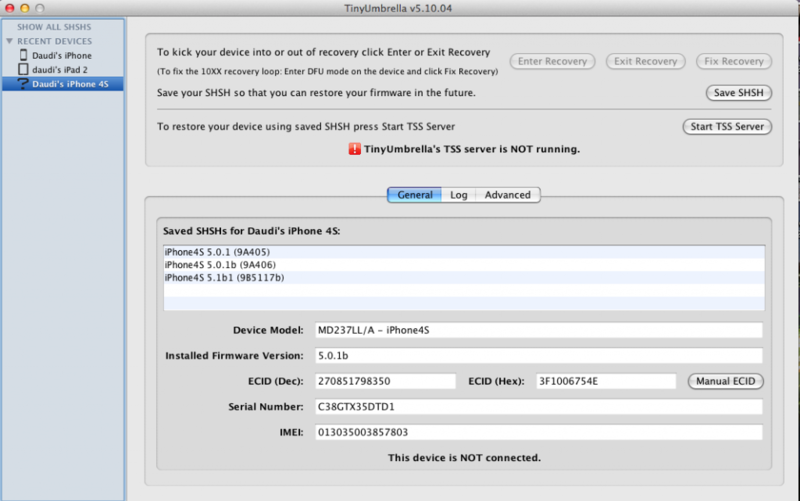 Although we cannot exploit/restore iPhone 4S SHSHs we still should save them just in case. I’ve just updated TU to support iPhone 4S 5.0.1b “9A406″. Today the tool to save SHSH blobs also got updated to save the SHSH Blobs for iOS 5.0.1 (9A406) for iPhone 4S. We can now only save the SHSH Blobs of iPhone 4S with the help of Tiny Umbrella, but we cannot restore to the iOS 5.0.1 of iPhone 4S because it is not yet vulnerable to any exploit. It is good to save the SHSH blobs for iPhone 4S for now because the iOS 5.1 is around the corner and it might come some time today or within this week. The iOS 5.1 beta 2 was released 2 weeks back ago aiming to fix the battery issues on iPhone 4S.